David Wilcock: Welcome back to “Cosmic Disclosure”. I’m your host, David Wilcock, and we’re here with our special guest, Emery Smith, continuing our fascinating discussion about the co-workers that he actually interacted with as live beings while in the underground facilities. Emery Smith: Thanks, Dave. Excited to be here. David: What was the very first extraterrestrial that you saw on these bases, like the first time you actually saw a living being that was not human like us? Emery: That’s the Tall Whites. David: So could you tell us a little bit more about that first meeting? Because, obviously, I would think the very first time you actually see a living being that’s clearly not one of us, it has to be just an absolute landmark moment in your entire life. Emery: Well, actually, indirectly, by seeing these from afar, and seeing these through different windows and different programs, and then reading about them, I had a really good understanding of what was going on way before I was even getting able to see these, by researching programs that I was allowed to. Emery: So they’re breaking you in first just by watching videos and reading books and reading things on their database system that have to do with the past of working with these beings and these creatures. David: So let’s open up this Tall White discussion, because there has been some confusion in terms of, for example, certain discrepancies between the whistleblower named Charles Hall, and what he called Tall Whites, whose eyes seemed to be more like Greys, but had a bluish tinge. We have Pete Peterson who’s described his experience with Tall Whites, and he said that it doesn’t really mean any one type. It just is a classification based on their appearance. David: And Corey has his experiences with the Anshar, which appear to be very much more human-like, but as they age, they will get taller eventually. So what would you call Tall Whites? Just give us a description of what they look like, and any other specific physical identifying details to start with. Emery: Sure. They’re over 7′ tall. They have a small face, a little bit smaller than ours. They’re very slender in the arms – very ectomorphic as we would say. They have a very fluid movement that’s actually like a dance. So it’s kind of like this: when they move, they’re articulating their joints, and their limbs are flexible, not like ours, which are really rigid. They also have a very deep understanding of all of our belief systems, and they’re very compassionate, and they’re very smart. And I’ve seen them from afar probably six to seven months before I was actually next to a few of them during a project. David: So if I gather correctly, then, the face would be predominantly like ours, but just smaller? Emery: It’s slender. 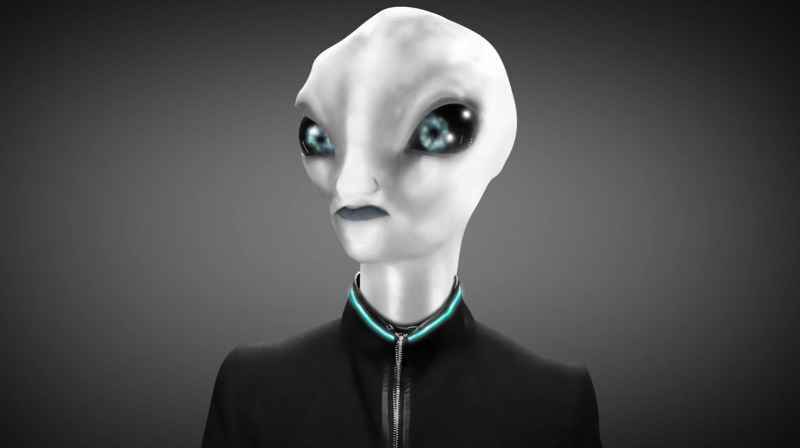 You know, I hate to bring up movies, but in the Star Wars movies, there was a group of Tall White beings that were making clones of one of the soldiers there, and they were in charge of this planet, and they had this really slender, beautiful, oval face with these really beautiful eyes that took most of the face up. So the eyes were at least two times to three times larger than our own eyes, and their nose was almost non-existent – very small, very petite, kind of like an Asian nose – with just very small nostrils and beautiful lips and a nice small mouth. David: So the eyes are a very prominent features, then . . .
David: . . . but they would be almost like one of these Anime characters in the sense that it still looks human, . . .
David: . . . but they’re just a lot larger. Emery: Exactly. The eyes are oval, and they’re offset about 20°, so they are like this. Ours are this way [horizontal], but theirs are offset just a hair, so it’s coming this way, because the ovals . . .
David: So more of a Russian or Scandinavian look, then? Emery: And when I refer to the Tall Whites, I am not referring to the blond blue-eyed tall people from Scandinavia that you hear a lot in pop culture of . . . of those. David: Like the so-called Nordics. Emery: Correct, the Nordics. I mean, their skin is just ash white. It is so white that they actually . . . light comes off of them and reflects off of them. It’s a really beautiful type of skin . . . [There’s] kind of like a sheen to it. But [they’re] very white, and [have] very long fingers and regular feet like we have. Emery: There is no hair. I’ve never seen hair on any of them. Emery: They do wear clothes and uniforms like we do, usually skin-tight types of clothing. They have a very intricate internal organ system that is capable of living on almost any planet or any atmosphere. So they can breathe a lot of different types of gaseous chemicals, and different types gases that would normally kill one of us. And they have a very small chest in a V shape. David: So it definitely doesn’t look like a Grey. David: It would be like a bald person, like us, with white skin, but a more skinny-looking face who’s just really tall. David: One of the things that Pete described about these beings was that they would have a wand. Did you ever notice them carrying a wand . . .
David: . . . or any type of tools? Emery: I never seen them have a wand, but they did wear these special bracelets and these special collar-type things. And I don’t know if it has something to do with their internal organ system, but I wasn’t really debriefed that much. That’s all they told me. David: Okay. Did you have any idea as to what those bracelets or collars might function for? Emery: Well, they had lights on them, and these lights were like a blue ribbon around the center of the collar. So let’s say the collar was about an inch thick – I mean, an inch wide [25.4mm] – very thin, and in the middle of that collar, about a . . . maybe a quarter of an inch, was a stripe that went around it. And this light rotated around this blue centerpiece, and it was always on, and it always coincided with the bracelets they had on. David: They rotated in phase? Emery: The light . . . Yeah, they both rotated in the exact same phase. David: So did you ever have an intuitive sense, or did you try to guess as to what that might be for? Emery: I think it has something to do with . . . maybe, when they travel to different places, this helps with getting certain nutrients and chemicals and minerals and vitamins into their body somehow. I think it’s somehow keeping their voltage up and keeping them energized. David: The version of Tall Whites that Pete was talking about, which may not be the same, he said that they really have trouble getting too close to humans like us, that it’s almost a psychic mess for them. Did you observe them in some degree wanting to keep distance from regular Earth humans? Emery: Not these Tall Whites, but, yes, there have been other hybrid Whites that are over-sensitized by our fields of energy, because they’re picking up on every cellular energy we have. It’s not like we’re all in one sync to this other white race of ETs, and I think it has to do with . . . We carry a lot of bacteria – good bacteria and bad bacteria – and viruses on us, and they all give off this special pulse of energy, and it’s overwhelming for them. And they can actually get sick by being around a human too much. Emery: So I think that’s what he’s referring to. David: Describe for me the first time that you encountered a Tall White, because this is where we’re saying now, like you saw him through the window, . . .
David: . . . you might have had some briefings or something . . .
David: . . . but the first time that you actually are face to face with a non-terrestrial entity. Emery: They were brought in on a number of occasions, working on humans that have deceased for unknown – I don’t know why – unknown reasons. Emery: But they obviously were very concerned about this, and they would be brought in and worked with the team. And I had two of them at one time in the same room that I was working on taking some samples from somebody. David: Was it easy to tell the difference between men and women? Emery: Ah, yeah. There was a feminine . . . more slender facial features, and the eyes were a little bit not as large, and the eyebrows also, not eyebrows, but you can see there’s a tinge of an eyebrow, but not hair. It was just like the pigment was different above the eyes, a little bit off white, I’ll say. And you could tell by those two reasons, just facial features. The bodies looked pretty much identical. And I’d never seen them walk around. They always had some sort of clothing on or something. David: And what did that clothing look like? Emery: It was always some sort of skin-tight apparel, like a Spandex of some sort. They always did have gloves on all the time. So this clothing material was covering pretty much their whole body except their neck and face. David: I’m curious about what was their form of communication. Did they speak with their mouths? Emery: They’re very telepathic. They can speak perfect English and other languages – all the languages actually – but you don’t have to because they will just look at you. And they say, “When you have the look, please look back”, because it’s this eye thing that they do. When you see their eyes and your eyes, it’s like a link of some sort, where it’s like the . . . . however it works, it’s downloaded – everything that they’re thinking – to you, and they’re very receptive to you as well. Like, they know everything about you once you meet them. David: So if you were to have an unloving or judgmental thought about the way they look . . . because I’m sure this happens sometimes. David: What would occur? Like, let’s just walk though a situation where . . .
Emery: Yeah, they don’t . . . They don’t react to that, because they know that sometimes it takes a little time for people to get used to them because they’re different, and the same thing, I think, would happen to us if we were thrown into their world. We would have to be really egoless and have to accept that maybe I won’t be liked because of the way I looked, or because I know everything that you’re thinking right now, which is okay. It’s so what, and then what? David: So I really do want to get a little more specific on the exact moment that you first made eye contact with a non-terrestrial being. Where were you? What was it like that first moment you looked into its eyes? Emery: We were getting dressed with our suits to go into an operating room. And their suits are a lot different than our suits, of course. Theirs are for their bodies. And I just noticed as the technicians were helping them get dressed and Ziploc their suits up, the fluid motion they had of going into the suit. It was very fluid, and being at the operating table, and I was helping them with some instruments, and they moved so fluidly, and so . . . but it’s really fast. They move fast, but it’s just this dance. It’s really interesting. So I don’t want you to think it’s like super slow, but it was the fluidness of . . . You know, their bodies are, like I said, . . . their bones are very flexible, unlike our bones. But they do have the five fingers and the hands. They’re just longer fingers, and the palms are more square, not round like ours. And those are some of the features that I knew. And I remember looking at them, not even saying anything, and it was like a greeting. It was like as we’re getting ready to go in, and we looked at each other, and just the word, “greeting”, came to me. It wasn’t a voice. It was just the word, “Greetings”. And I remember, in my mind, looking at them and saying the same thing in my mind, and they cracked a smile. You know, I could see . . . They have the same facial features. So their eyes move up and down. They can move their nose, and they have muscles in their face. David: Could they throw things into your mind, like colors, symbols, visual images of places . . .
David: . . . give you a holographic type of . . .
Emery: Yes. They even have a way, if they want to teach you something that you don’t know, to basically download that into your brain – into your consciousness – in a matter of seconds. So you could learn something pretty quick that they’re doing on the table from being just across the table from them. David: When you were working with them in these autopsies, you had mentioned that sometimes they were concerned about humans from here who had died in strange ways. What were some of the other circumstances that they were called in? Emery: Really tough cases where there might have not . . . that they would not know why this ET or this human died. David: “They” meaning the people on the base. Emery: The people on the base would give them, probably, the most difficult cases. David: To the Tall Whites? Emery: Yeah, to the Tall Whites. And sometimes they would not allow us in the rooms with those types of patients, but we were part of a team. You have to understand, even though you’re not in the room, you still can be working on the outside of the room looking in and helping get supplies and things. David: Can you recall a specific example of an autopsy that was not of a person from Earth that involved a Tall White, and just tell us what type of being it was and why was it so hard to solve? Emery: Well, this falls under the chemical thing again. We do get beings that come in – other hybrid Whites that look shorter. They’re about our height, our size, but they’re very, very white, and they have crystal-clear blue eyes. They always have white or blond hair, so . . . and they have ears, unlike . . . The Tall Whites don’t really have ears, . . .
Emery: . . . but the human-hybrid Whites, I call them, actually do have ears, and they look kind of like us. And their teeth are very different. Their teeth are round. So they’re like half-mooned, not square like ours. Emery: And it is weird. But you don’t really see their teeth too much. And we were working on this one that was brought in that had these . . . it looks like burned injection spots that ran up and down their chest. And there were about six little holes – 1, 2, 3, 4, 5, 6 – all the way down to the belly button. And it looked like it was some sort of weapon that burned it into their skin. But in the middle of these circular burns were three dots that looked like a triangle, if you could attach lines to them, a perfect triangle. Emery: And they were trying to figure out what type of weapon killed this hybrid White, and why and where did it happen. Like they can actually attach themselves to the brain of a dead being and download its information to their head, . . .
Emery: . . . and they can find out, “How did this happen? Where did it happen? Who’s responsible?” and figure out a whole story within minutes. David: Wow! So what was the conclusion? Were you aware of the conclusion of how it died? Emery: No, I was not aware, but they did know what happened, and they did look very sad about this. You can see the anguish on their face. David: When you saw a movie like “Men In Black”, what was your feeling about that, where you have Will Smith, and there are agents working in these underground facilities with all these extraterrestrial around? What was your feeling when you saw that film? Emery: I’m really not a big fan of that. I don’t like when Hollywood makes fun of extraterrestrials as some sort of game or some sort of horrible threat. Emery: And I did not resonate with that movie at all. But there are many movies out there, and animation, where extraterrestrials are portrayed very well, such as the one that you and I saw recently, called . . . was it “Valerian”? Emery: Yeah, and these ETs looked exactly like these Tall Whites. Emery: And I remember . . . Wasn’t there a part in there where the United Nations of ETs were coming together, and there were all different kinds? David: That’s right – right at the beginning. Emery: Yeah, that was a very accurate depiction of the many different kinds of extraterrestrials that are out there that have to bring their own environment. Like one was like a fish or something. It had an aquarium on his head. Emery: And, of course, that’s kind of funny, but it actually is true. Like we talk about ETs wearing things that are from either their planet to keep the energy correct, and also they might have to have a special helmet just for their head to sustain their life. So that was a really good . . . I was impressed with the screenwriters and the writers and the animators that did that. David: Now, Corey Goode, when he had his first experience on the Moon in modern times, so he says, encountered an avian type of humanoid that apparently nobody in the space program had seen before. And this is the Blue Avian. We talked about this. I know you’ve seen the image. Emery: Yeah, I’ve seen this image. 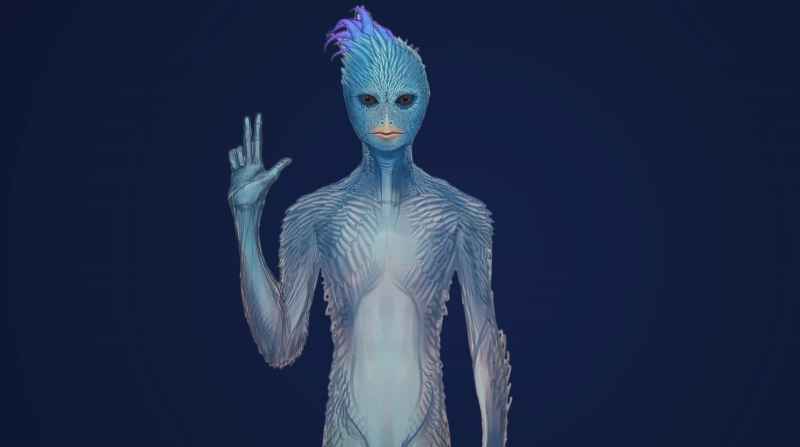 David: So did you ever see any type of Avian humanoids yourself, such as these Blue Avians, or other types that were similar? Emery: Yeah, similar to that, but not specifically like that. They were very human-like, and they had very small feathers and large skin pores, but they, for the most part, looked more human than they did a bird. But they did have these attributes of certain things, like they didn’t have a nose. They did have, like, a small beak there, but the beak actually had teeth in it. And they didn’t have the kind of head you would see . . . It wasn’t like an exact bird head. And the eyes were flat across, just like ours, but they could see perfectly straight this way, instead of . . . like a bird probably has more on the outside. So very more, like I said, more human than anything, but had very small wing feather . . . like little skin flaps under their arms, and lots of feathers on the back, but not so much on the face and the chest at all. David: Did any of them have tropical colors like a toucan, or how did they look? Emery: Yeah, they did. There were turquoise ones with a beautiful purple, white and turquoise fading, in and out, up and down the body. So it might start with a blue head and neck, and then fade to white, and then maybe a light purple down towards the feet. But they had feet like we have feet, but it was, you know . 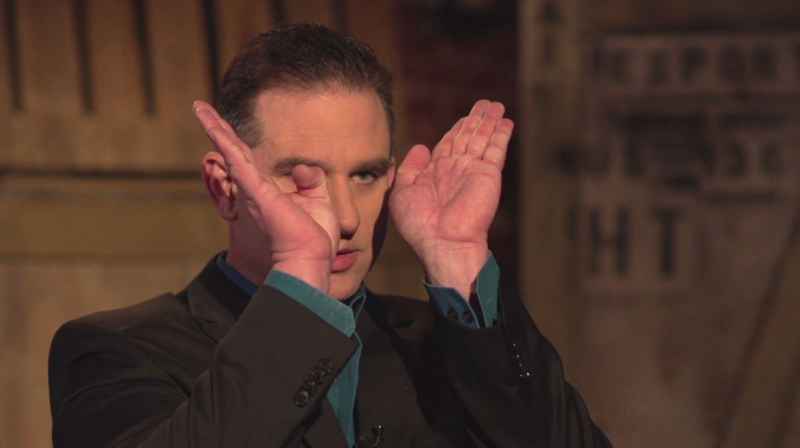 . .
David: They didn’t look like bird feet? Emery: No, not at all. But like I said, the only thing that gave it away was the facial features and the feathers, and that very scaly-type skin – a very porous skin. David: Well, this is kind of ridiculous, but how would you compare it to Howard the Duck? Emery: No! Ha, ha. Not like that. David: Because that’s a beak that really protrudes. Emery: That’s a big duck bill beak. Emery: But no, I’ve never seen anything like a big beak like that, except for the pterodactyl. David: Pterodactyl being sounds kind of disturbing. Emery: It does look probably scary to most people because it’s got these dragon attributes of these wings with hands, but it has legs just like we do – very thin legs, kind of like the Ant people. And they have very small wings that are attached like a fruit bat. The arms are part of the wings. And they always have a device with them. And this one was carrying a cylindrical device in its arm, like this, with its claw around it. And this one, this pterodactyl being, had an actual claw. It had the long, pointy beak that came all the way back – you know, the one that has . . . The actual bone structure actually goes farther back. Emery: And they communicate through a series of loud, high-pitched tones, not like an owl, not like a bird chirping, but just high-pitched tonality. David: Did you ever see any of these pterodactyl beings while you were in the underground bases? Emery: On the very deep, deep levels of these bases, we were informed that they were there. And they had to do with some sort of consciousness, and . . . I want to say religion, but it’s not. It’s a study of some sort of history long and forgotten. And they are sent in to . . . They’re like the people who put the puzzles together, these beings, and they can move things with their mind. They have telekinetic energies, and they can move small things around the rooms. And there might be anywhere from one to four of these beings looking at something and moving things around in these “think tank rooms”, they call them. David: Why do you think they were kept at the bottom of the base? Emery: I believe that, . . . because of the way they look, because they do look like a type of flying dragon. And I think because they don’t do well with being around a lot of other extraterrestrials for some reason. They seem to need a lot of space when they move around. So there’s areas . . . They just can’t walk through a door, leastwise they’re very abstract, bulky-looking. And, you know, just turning their head, they could . . . these things can be . . . Just their heads along could be up to 3’~4′ long. Emery: And just by turning their head, they can knock a lot of stuff over. So there’s a special place down there for them that they are allowed to do these . . . which I don’t know what the programs are. I just know they’re the thought-thinkers. They’re “the puzzle-solvers”, they call them. David: I want to run something by you that I’ve heard from some other insiders. Some of what I’ve heard – and this is actually from more than one guy . . . has told me this – certain ET groups apparently were worried about a reptilian-sentient life on Earth becoming really dominant and aggressive to other species. And the 65 million-year-old cataclysm that hit the Earth apparently was intended to wipe them out. And it was at that time that the Moon, which apparently is a used car – and I talked about this with William Tompkins – was then parked around the Earth to create a seasonal climate that would allow mammalian life rather than reptilian life to become dominant. I wonder if you ever heard about that scenario of the dinosaur catastrophe being a planned event to wipe out sentient reptilians? Emery: I have heard of “a event” that was intentional to destroy the Earth because Reptilians were not allowed on it anymore, because of Inner Earth beings, and also dates back to Atlantis and Lemuria and whatnot, that there was this war of some sort, that they were being utilized and used by these Reptilians, the Draco, or whatever you call them. And that’s what I read in some of the history books in there, but I don’t know how accurate that is because it was written not as a document. It was like someone was just telling you what happened back then. And there has been archaeological finds in the Vatican from this time that depicts Reptilian beings destroying Aquafarians and other beings of that time. David: I’m curious about whether you ever saw something that would look like the Yeti or the Bigfoot while you were working in these facilities, because some people have reported things like that. Emery: Yeah, I mean, I have personal experience with the Bigfoot, and the skunk apes, and the Yetis, and all the different types of . . . I remember in my teen years, around 16 years of age, there was a large white Chewbacca-type being, 8’~9′ tall, and I was camping out in Florida down in the south, near the Everglades. And it was probably around 150 yards away. It was far, but it was an open field. It was at dawn. And I just saw this being walking next to the fence line. And it was like 5′ higher than the fence posts, which were 4′ tall. And the stride of this thing was, like, over 6′. And I literally stopped in my tracks and watched this thing walk all the way across. And when I go back and check the dates, now that there are these things online – you can look for spottings of these extraterrestrials – I’ve noticed that in the area I was, this being has been seen many, many times by many people, and that was a great confirmation for me. It was greater confirmation for me when I started working in the labs to actually see these beings. These beings have been here a very long time. They work with the Inner Earth beings. They’re here to collect and gather data and DNA from all the living species and plants and water and animals in the water and fish and everything. And they’re cataloging this and putting it on a type of vault somewhere in order to preserve what Earth really is – kind of a museum for Earth somewhere. And that’s why you can never get these guys on film too much, because they have the ability to teletransport themselves at will. Emery: Yes. And they can be very mysterious and get out of somewhere really quick. David: Well, I just want to say this: It is amazing that we don’t have a widespread understanding of the reality of Bigfoot given the thousands and thousands of eyewitness sightings, the tracings of footprints, the very bizarre cases of property damage, where fingernail marks have clawed right through vehicles, and things like this. Why do you think we have such a hard time accepting these eyewitness testimonies of Bigfoot? Emery: Well, you know, these are very large animals. I don’t consider them too much human, I’ll say. But they have a consciousness and they have a job to do. And they’re probably the lowest-maintenance extraterrestrial that I know. And what that means is: they can be dropped on a planet with nothing and gather these items and catalog them and store them somewhere, and then, like the movie “Predator”, where they come down and hunt people and then take all their skulls back. So imagine this guy is coming down and snatching up a bunch of lavender and daisies. Ha, ha. David: So they’re not doing anything violent? Emery: No, they’re not allowed to. They’re actually prohibited from hurting any type of living creature. Emery: So they could take your hair, but they can’t take your head. David: So what you’re describing here sounds like a fairly intelligent being. Do they have communication skills? Could they speak, or do they have a telepathic . . .
Emery: Yeah, they’re the other ones that use their vocal chords to voice, and also they can do, like, . . . Elephants have this ability to send these large thumps through the ground, and these things can be heard for miles and miles and miles and miles away by another elephant. So they have that ability, and that’s why people hear really weird shrieks. They hear really weird thumping sounds. People usually say it’s someone banging on a tree or something, you know, and not so much that. And they can communicate that way too if they, let’s say, have a sore belly and they can’t use their diaphragm to make these noises. David: There do seem to be different types of Bigfoot. And so since we’re out of time now, I just want to round this out with: Do you think that there might be some that are not necessarily on this mission and are less intelligent and more primal and dangerous? Emery: I’ve read some documents in my classified, compartmentalized projects that stated that they have . . . If they get sick or something happens to them, they cannot use their teletransportation abilities, and they get lost or left behind on many planets, and they have to stay there indefinitely. And these are some of the lost ones that are hiding in the . . . But they’re very adaptable, and they like to work alone. They’re very solitude-type extraterrestrials that I heard only mate maybe once a lifetime. David: If they were going to teletransport back to where they came from, where would that be? Do you know anything about their origins? Emery: No, I don’t know anything about their origins, but I know they know . . . They have an indistinctive way to trace portals on the Earth, like natural portals on the Earth, not man-made portals, that they know where to go, and they might travel vast distances to do that. But they will never go through a city, or they’re not allowed to interact with the beings from any planet. David: Last question, real quick: Did you see them in the underground bases? Was there some loophole where they could actually work with us in these classified facilities? Emery: I’ve only seen dead ones. David: Oh, really? So they didn’t actually work in these underground bases with the rest of us? Emery: They said . . . There’s some rumors that they have. And I have seen things from far away that look like them. And there are catalogs of them being on the base, but I have not worked physically with one. David: Well, Emery, this is really fascinating. I want to thank you for coming out and giving us all this amazing information. David: And I want to thank you for watching. This is “Cosmic Disclosure” with our special guest, Emery Smith. If you desire to get a good deal from this paragraph then you have to apply such methods to your won web site. forthcoming post. Thanks one million and please continue the rewarding work.